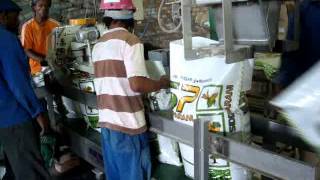 25 to 50 kg bagging system with two weighing scales. 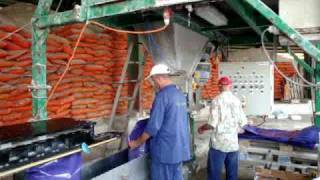 Automatic bag fill system for 15 to 50 kg bags. 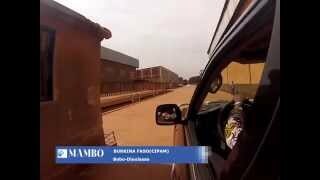 Capacity is 40 to 50 ton per hour, 800 to 1000 bags per hour. 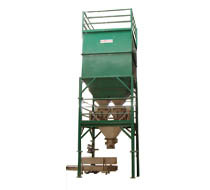 Suitable for granulated or powder products, such as grain or fertilizer. 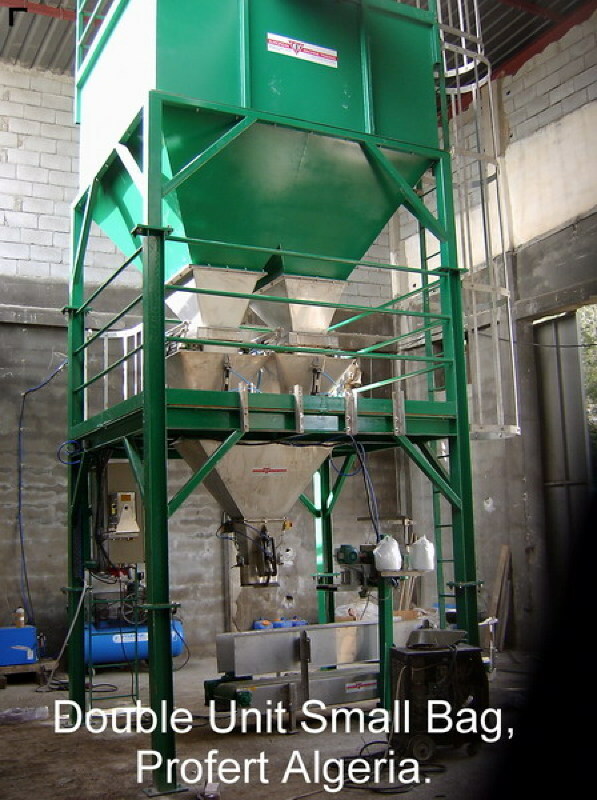 The small bag Double Unit is an automatic bag fill system for 15 to 50 kg bags. 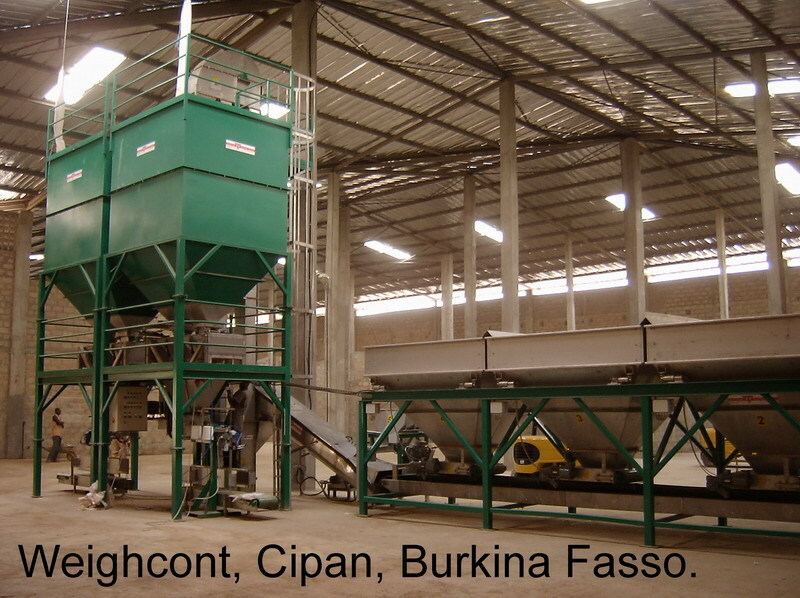 The unit has a steel frame and stands on 4 support legs, these legs support the bagging line and the hopper. The small bag Double Unit has two stainless steel weighing scales with a content of 60 kg each. This weighing scale is mounted on a 4 holder frame and a digital load cell that produces accurate weighing. A pneumatic halve moon slide that is mounted under the storage hopper, controls the flow of the product to the weighing scale. When dosing the product, a large or fine valve can be used automatically by means of the position of this slide. An electrical switchboard mounted at the side of the filling machine controls the filling process. The complete unit can operate by a weighing indicator automatically or manually. 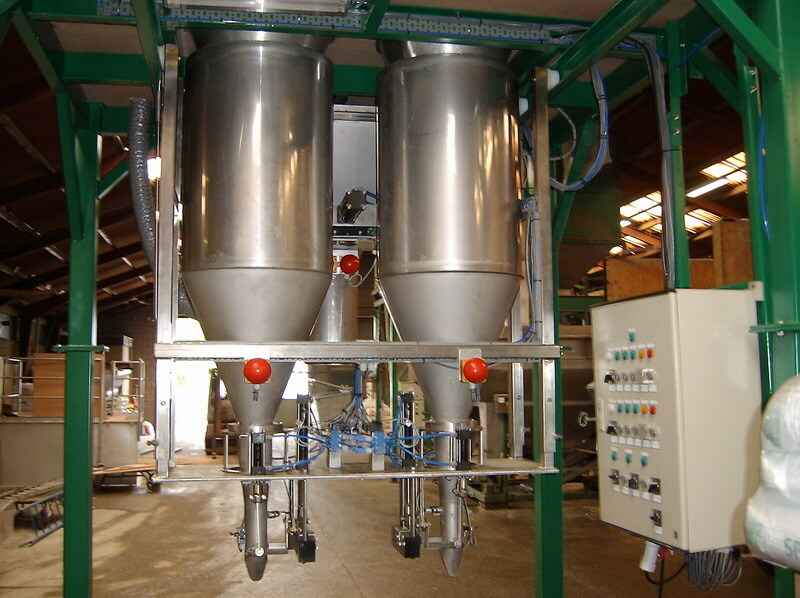 Pneumatic stainless steel cylinders with a fibreglass coating operate the complete system. The operator fastens the bag around the filling mouth. A clamp system holds the bag in place. The weighed product falls into the bag. When the bag is full, the clamp releases the bag and the system transports the full bag to a sewing or seal machine. The capacity of the small bag Double Unit is 800 bags per hour when using an open mouth system. When using a valve system with two filling mouths, the capacity is 600 bags per hour. This product can be adjusted to customer demands.